WASHINGTON, March 25. /TASS/. 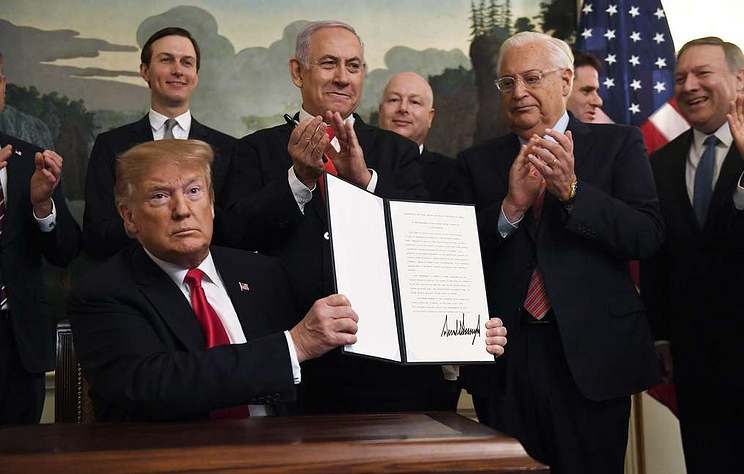 US president Donald Trump has signed a proclamation recognizing Israel’s sovereignty over the Golan Heights. The signing ceremony took place at the White House during Trump’s talks with Israeli Prime Minister Benjamin Netanyahu and was broadcast live by US news channels. Apart from Syria and other Muslim countries, Russia and some key European Union members, including Germany and France, have also opposed Trump’s decision to recognize Israel’s sovereignty over the Golan Heights.